Companion app for Home Remote on iOS. Is there a better alternative to Home Remote - Activator? Is Home Remote - Activator really the best app in Productivity category? Will Home Remote - Activator work good on macOS 10.13.4? Home Remote - Activator is a companion app for the well received Home Remote app for iOS. It will sync your iOS actions via iCloud and allow them to be called from your Mac. If you don't have iCloud enabled you can still export a configuration file from the iOS app and import it here! It also supports Home Remote: Remote - A new feature that will remove the need for port forwarding if you want to control your home automation from outside the home network. Some examples of hardware supported: LIFX, LimitlessLED, Belkin WeMo, Raspberry Pi, Milight, EasyBulb and Hue. Lots more also supported via URL commands. Bug fixes - The auto start feature has been removed as it was not working for the majority of users. 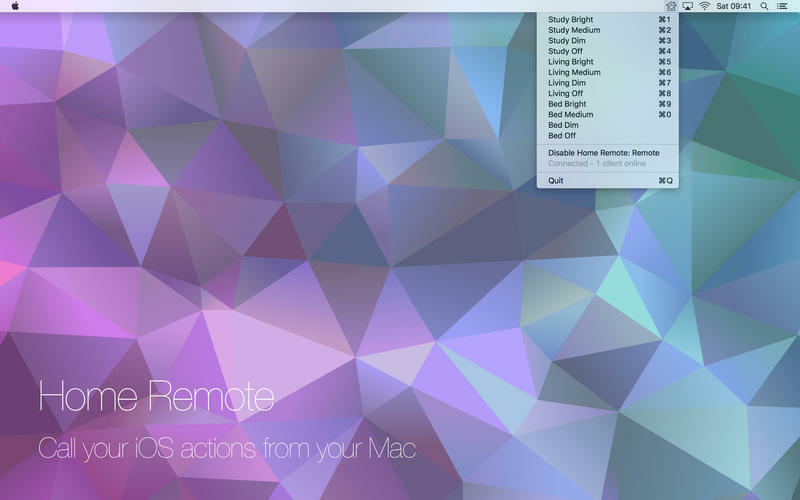 Home Remote - Activator needs a review. Be the first to review this app and get the discussion started! Home Remote - Activator needs a rating. Be the first to rate this app and get the discussion started!